Plagued by anxiety and depression for much of his twenties and early thirties, Ed Halliwell frantically searched for ways to understand and relieve his distress. Plagued by anxiety and depression for much of his twenties and early thirties, Ed Halliwell frantically searched for ways to understand and relieve his distress. Eventually he stumbled on meditation and Buddhism, and discovered a path that was different from the other medical, psychological and spiritual cures he had tried. That path was mindfulness and the deeper he went into the practice the more it transformed his life, easing his depression and helping him see each moment as precious. A one-time editor for FHM magazine, Ed's life has changed radically - he now teaches mindfulness to others. 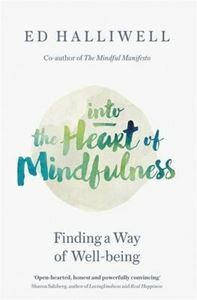 In this book, Ed explores how mindfulness can help us see and transform our unhelpful biases and habits, enable us to live more at peace with stress and uncertainty, cultivate cheerfulness and compassion, and help us to find our life's calling - if we are willing to journey to the heart of the practice. Offering his own experiences as inspiration, Ed emphasises that mindfulness training is a lifelong path and complete way of being rather than just a short course or quick fix. With practical advice and refreshing candour, he explores how working with the realities of our minds, bodies and day-to-day existence - rather than striving for positive results - can, paradoxically, help us rediscover a richly nourishing, deeply-textured life.